Chris Moule Landscapes - Landscaper based in Hallow, Worcestershire. Chris Moule Landscapes are based in Worcester, with 20 plus years of experience in landscaping and driveways. 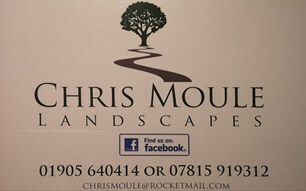 Chris Moule Landscapes began trade in 2011. After 12 years of working at Potters' Sawmills and learning the tricks of the trade, Chris decided to go independent and make a name for himself. What do Chris Moule Landscapes specialise in? Get started on your garden transformation with a free no obligation quote. 12 mile radius of central Worcester.